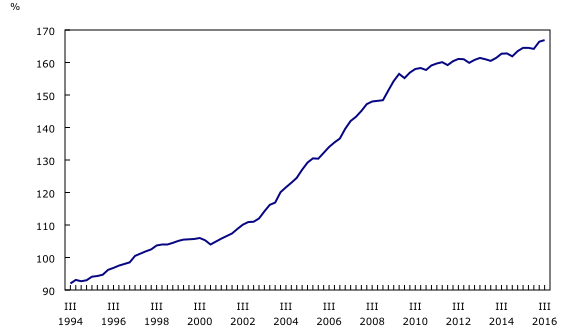 National wealth, the total value of non-financial assets in the Canadian economy, rose 1.4% to $9,730 billion at the end of the third quarter. The main contributor to the gain was a 1.4% increase in the value of real estate. 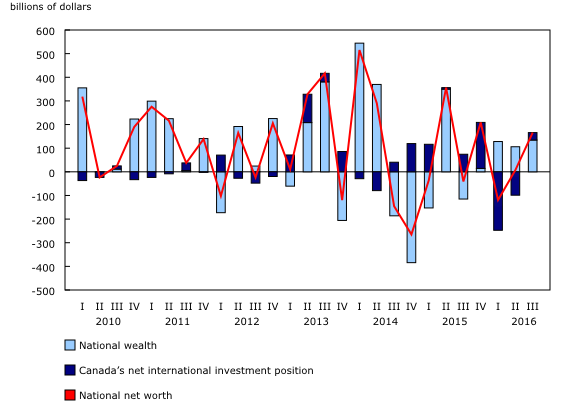 National net worth, the sum of national wealth and Canada's net foreign asset position, increased 1.7% to $9,845 billion by the end of the third quarter. 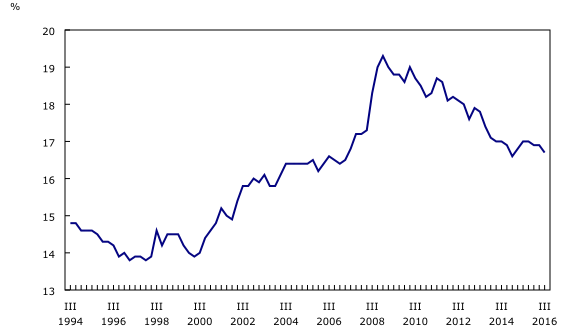 This increase was principally due to higher national wealth, combined with a 37.5% gain in Canada's net international investment position. On a per capita basis, national net worth was $270,300 compared with $266,700 in the second quarter. Canada's net foreign asset position increased by $31.5 billion in the third quarter to $115.3 billion, following two quarters of decline. 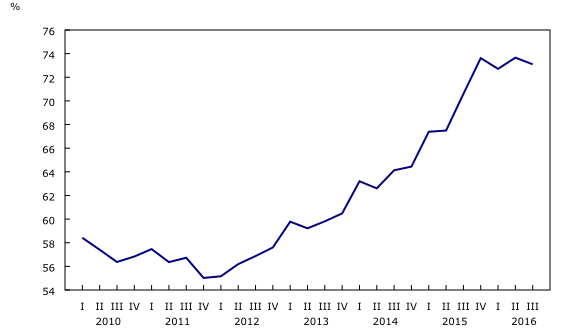 Canada's international assets have now exceeded international liabilities for eight straight quarters. Household sector net worth at market value rose 2.5% in the third quarter to $10,133 billion. On a per capita basis, household net worth was $278,200. The leading contributor to the rising net worth was a 3.2% increase in financial assets as the value of investment fund shares, particularly mutual fund units, life insurance and pension assets, benefited from stronger domestic and foreign securities markets. Non-financial assets grew 1.2%, mainly real estate assets. This was a slowdown from the 2.0% growth in the second quarter. Total household credit market debt (consumer credit, and mortgage and non-mortgage loans) reached $2,004 billion at the end of the third quarter. Consumer credit was $590 billion, while mortgage debt stood at $1,312 billion. The share of mortgage liabilities to total credit market debt edged up from 65.1% in the second quarter to 65.5%. Household credit market debt to adjusted disposable income (excluding pension entitlements) edged up from 166.4% in the second quarter to 166.9%. In other words, there was $1.67 in credit market debt for every dollar of disposable income. Adjusted disposable income (+1.0%) increased at a slightly slower pace than household credit market debt (+1.3%). Leverage as measured by the ratio of household debt to assets edged down from 16.9% in the second quarter to 16.7%. On a seasonally adjusted basis, households borrowed $18.2 billion in the third quarter, down $10.6 billion from the previous quarter. Mortgage borrowing represented $17.3 billion of total borrowing, a decrease from $20.1 billion in the previous quarter, while borrowing in the form of consumer credit and non-mortgage loans was $850 million, down significantly from $8.6 billion in the previous quarter. The household debt service ratio (seasonally adjusted basis), measured as total obligated payments of principal and interest as a proportion of disposable income (adjusted to include actual interest paid), edged down from 14.1% in the second quarter to 14.0% in the third quarter. The interest-only debt service ratio, defined as household mortgage and non-mortgage interest paid as a proportion of disposable income, was 6.1%. The household savings rate increased from 4.8% in the second quarter to 5.8% in the third quarter. The ratio of federal government net debt (book value) to gross domestic product edged up from the second quarter to 30.9%. 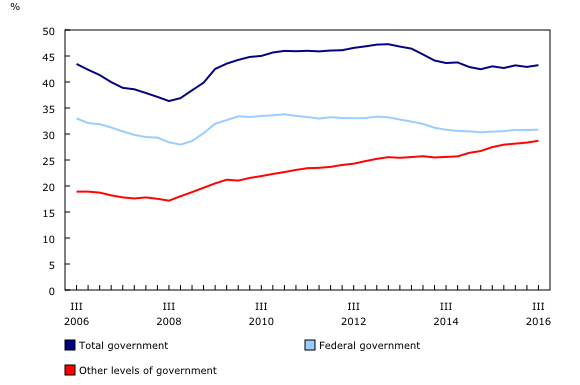 Meanwhile, the ratio for other levels of government increased from 28.4% at the end of the third quarter of 2015 to 28.7%. The federal government recorded $10.6 billion in net issuances of Canadian bonds in financial markets in the quarter, offset slightly by $1.0 billion in net retirements of short-term paper. Other levels of government borrowed $8.4 billion on financial markets during the quarter. The bulk of the borrowing was composed of $13.8 billion in net issuances of Canadian bonds and debentures, which were slightly offset by $5.5 billion in net retirements of Canadian short-term paper. Non-financial private corporations demand for funds increased by $32.3 billion, primarily through non-mortgage loans, new issues of equity and increased borrowing in financial markets to finance operations and merger and acquisition activities. This was down slightly from $32.7 billion in the second quarter. On a book value basis, the credit market debt to equity ratio of non-financial private corporations was down slightly from the previous quarter. This represented 73 cents of credit market debt for every dollar of equity at quarter end, compared with 74 cents at the end of the previous quarter. Overall, the financial sector provided $20.0 billion of funds to the economy through credit market instruments, down sharply from $34.2 billion in the second quarter. The funds provided in the third quarter came in a variety of forms including mortgages ($28.2 billion), non-mortgage loans ($4.7 billion), consumer credit ($1.6 billion) and equity ($1.7 billion). The value of financial assets of financial corporations increased 3.1% at the end of the third quarter to $13,053 billion. The principal contributors to this growth were increases in the value of domestic and foreign equity and in the value of investment fund shares, as this sector also benefited from stronger domestic and foreign securities markets and increased lending to households and corporations. This release of the financial and wealth accounts comprises the national balance sheet accounts (NBSA), financial flow accounts (FFA) and other changes in assets accounts (OCAA). The NBSA are composed of the balance sheets of all sectors and subsectors of the economy. The main sectors are households, non-profit institutions serving households, financial corporations, non-financial corporations, government, and non-residents. The NBSA cover all national non-financial assets and financial asset-liability claims outstanding in all sectors. To improve the interpretability of financial flows data, selected household borrowing series are available on a seasonally adjusted basis (CANSIM table 378-0127). All other data are unadjusted for seasonal variation. For information on seasonal adjustment, see Seasonally adjusted data – Frequently asked questions. The FFA articulate net lending or borrowing activity by sector by measuring financial transactions in the economy. The FFA arrive at a measure of net financial investment, which is the difference between transactions in financial assets and liabilities (for example, net purchases of securities less net issuance of securities). The FFA also provide the link between financial and non-financial activity in the economy, which ties estimates of saving and non-financial capital acquisition (such as investment in new housing) with the underlying financial transactions. While the FFA record changes in financial assets and liabilities between opening and closing balance sheets that are associated with transactions during the accounting period, the value of assets and liabilities held by an institutional unit can also change for other reasons. These other types of changes, referred to as other economic flows, are recorded in the OCAA. The OCAA have two main components. One is the other changes in the volume of assets account. This account includes changes in non-financial and financial assets and liabilities relating to the economic appearance and disappearance of assets, the effects of external events such as wars or catastrophes on the value of assets, and changes in the classification and structure of assets. The other main component is the revaluation account, showing holding gains or losses accruing to the owners of non-financial and financial assets and liabilities during the accounting period as a result of changes in market price valuations. At present, only the aggregate "other change in assets" is available within the Canadian System of Macroeconomic Accounts; no details are available on the different components. Definitions concerning financial indicators can be found in "Financial indicators from the National Balance Sheet Accounts" and in the System of Macroeconomic Accounts glossary. Data on financial and wealth accounts for the third quarter were released along with revised data for the first quarter of 2013 to the second quarter of 2016. These data incorporate new and revised data, as well as updated data on seasonal trends. Additional information on the treatment of natural resource wealth in the NBSA is available in the article "Natural resource wealth statistics in the National Balance Sheet Accounts." Data on the national balance sheet and financial flow accounts for the fourth quarter of 2016 will be released on March 15, 2017.